This is Part three in a series of articles and in this article we will focus on the LEDs we use, particularly our new revolutionary18K white LED. First we will explain what LEDs are and how they work. A LED is not a miniature light bulb, it is actually a semiconductor much the same as those used to power our speakers in our stereo systems. Instead of generating power or wattage, they generate light. A LED is actually the simplest form of a diode which makes these semiconductors easy to work with as they only have two leads. LEDs are specially constructed to release a large number of photons outward. They are housed in a plastic bulb that concentrates the light in a particular direction. Most of the light from the diode bounces off the sides of the bulb and travels on through the rounded end so there is no wasted light. Metal halides and flourescent lamps waste a lot of light since the light travels in all directions and must be redirected by reflectors into the aquarium. LEDs have several advantages over metal halide and HQI lamps. For one thing, they don’t have a filament that will burn out, so they last much longer. And, their small plastic bulb makes them a lot more durable. But the main advantage is their efficiency. In conventional incandescent lamps the light production process involves generating a lot of heat. This is wasted energy because a large portion of the available electricity isn’t going toward producing visible light. LEDs generate very little heat, and a much higher percentage of the electrical power is going directly to generating light which drops electricity demands considerably. Watt for watt, LEDs output more lumens of light than metal halides, HQI and flourescent. Light emitting diodes also have a higher luminous efficacy than other types of aquarium lamps. For example, an EvoLux LED produces 76.9 lumens per watt compared to an incandescent bulb’s 17 lumens per watt. Another huge benefit is that they last; LEDs can have lifetimes of 50,000 hours or more. Manufacturers of Aquarium LED fixtures are increasing on a weekly basis and it certainly appears that LED lighting over our aquariums will be the norm in a very short time. Most of these companies use off the shelf SMT (Surface Mount Technology) diodes, and in some cases such as LED strip lights, LED ribbon strips are used. 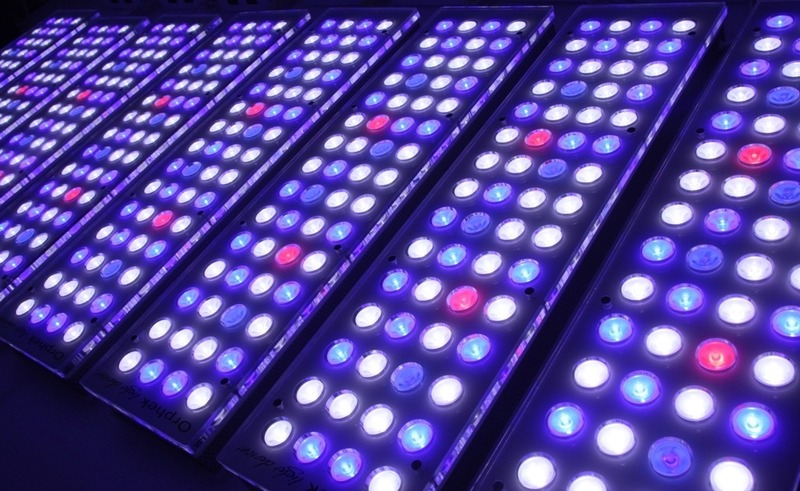 By using off the shelf LEDs, companies are limited to wavelength and/or Kelvin temperatures so the need to add different color diodes is necessary to produce the desired color or effect they want, and to mimic the PUR wavelength which is so necessary for proper coral growth. Red, blue, green, and yellow are usually added to achieve the desired effect but these colors also have lower lumens per watt than the white LEDs which lower the total lumens per watt of the entire fixture while still not generating a good PUR spectrum. With Orphek LED lighting, the white LEDs are custom made to Orphek’s specifications with the correct amount and type of phosphors so that blue lighting can actually be obtained from white LEDs which have the highest lumens per watt. Because of this breakthrough, Orphek can reduce the amount of colored LEDs other manufacturer’s use that are necessary to obtain the blue effect which is a necessary wavelength in the PUR spectrum. There is a big difference in lumens per watt between blue LEDs and white LEDs. If you look at the LED make up of Orphek’s fixtures, this can readily be seen. The graphic below shows the diode make up of the 100 LED multichip used in the DIF 100XP. As you can see, there are only 10 diodes used (red and orange) for enhancing the color of the corals. Our expertly designed and produced lenses are made from optical quality glass to ensure the light from the few colored diodes that are used, is evenly spread throughout the aquarium. There are no dead spots. If you look at Cree XP-G LEDs on their web site, the white diodes are only available in cool white or warm white so much more blue must be added to achieve the desired color. For example, the DIF 100XP which does not use Cree LEDs, but uses our own proprietary 18K white diodes. Our LEDs have no model numbers; you cannot order these LEDs from a LED company for DIY projects. Orphek uses several American LED companies to produce their diodes to their exact specifications. We have never used cheap Chinese made diodes in any of our products. With Orphek’s revolutionary technology we have designed the first white 18K LED that actually produces blue with no appreciable loss of lumens per watt. The benefits of this new diode technology are high lumens per watt as well as a high CRI index. There is not another aquarium LED lighting manufacturer that can state this. Our fixtures are very low in the 550-620nm range which is the range nuisance algae and cyanobacteria thrive on. In the graphic below you can see the high amount of light being generated by the Cree 7000K LED in the 550-620 wavelengths. Compared to Orphek’s white LED, this is very high and will contribute to nuisance algae and/or cyanobacteria. The term PAR means Photosynthetic Available Radiation. This range covers the light spectrum from 400 to 700nm. Not all of this range is necessary, or even recommended for corals and clams. The term PUR means Photosynthetic Usable Radiation and is the spectrum corals and clams best respond to. With LEDs, we cannot waste energy providing unneeded wavelengths, but focus our energy in the needed spectrum which falls between 400-550nm and 620-700nm. In this regard we can provide high intensity lighting in these needed wavelengths. 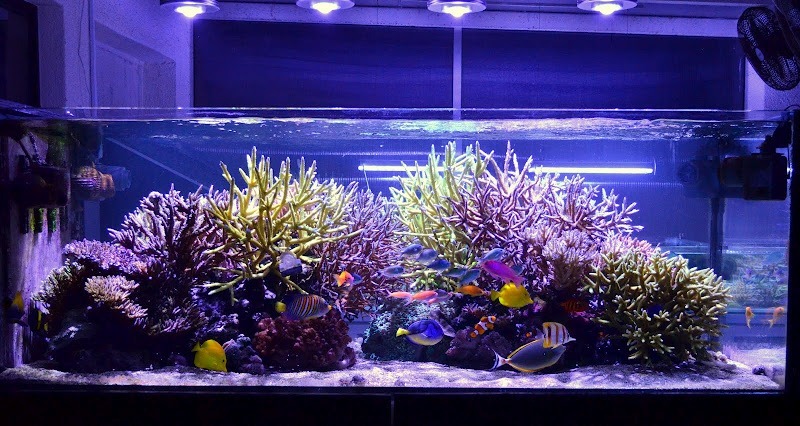 With other forms of lighting, a high PAR is needed to grow corals because there is much energy wasted in unneeded wavelengths so the PUR wavelengths available must be amplified to provide the light energy needed. With Orphek LEDs, the spectrum is carefully tuned to the PUR wavelengths and a PAR reading of 100 at the bottom of the aquarium will provide enough upward gradients to grow the corals and clams we generally keep in our reef tanks. The recent review of the DIF 50XP will show PAR levels at various distances. Orphek’s R&D department is always experimenting with different types of diodes and electronics to further improve our products. As an example, the current PR 156 fixture uses completely different diodes than the original model did. The appearance of the corals is stunning under our 18K white LEDs. Before buying any LED fixture, compare their spectrograph with ours. Is their spectrograph high in reds and yellows, do they use green LEDs for effect which have no real benefit for growing coral. What are their PAR/PUR readings compared to ours, and especially look at these figures at deeper depths where Orphek excels in high PAR readings. Be aware that a high PAR reading means little unless it is measuring the light in the PUR range, the range corals best respond to. To be specific, this range falls between 400-550nm and 620-700nm. Our new multichip using 60% 18K white LED diodes duplicates the PUR range perfectly. Revolutionary 18K LEDs not found in any other LED fixture on the market.